Lunchtime Talks are a series of informal presentations at Watershed's Pervasive Media Studio. They normally take place at 13:00 on a Friday, are free and are open to everybody who is interested in what they do. Come along, bring a sandwich, and get to know more about the Studio community, current and up-coming projects, or residents' work. Following the live streamed world premiere screening of Blast Theory’s Bloodyminded earlier this Autumn at Watershed and other cinemas across Europe, we are excited to be joined for this special Lunchtime Talk by the film’s Director, Matt Adams, about the making of the film. The project was co-commissioned by Attenborough Centre for Creative Arts as part of 14-18 NOW, the UK’s arts programme for the First World War centenary, and broke new ground in artistic and technical ambition. The film was recorded in one take over 90 minutes and streamed live to over 126,000 people online and in cinemas. Audiences also interacted in real time, sending their responses to the narrator that became part of the film. 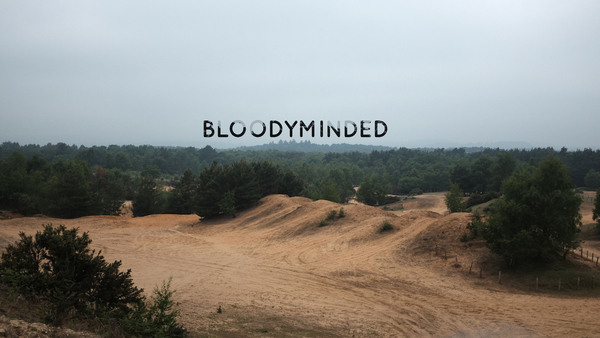 Bloodyminded follows SJ, played by Isis Davis (Electric Dreams, Lie Low), as she breaks into an army base on a personal mission: to bury the ashes of her great-grandfather Harold Steele, one of the 16,000 conscientious objectors imprisoned under life-threatening conditions during World War One. The film was inspired by the conscientious objectors of World War One. It drew on in-depth research and one-to-one interviews with soldiers with front line experience, followed by months of preparation, recess, casting and rehearsals. This talk will offer a rare insight into the technical processes and challenges involved in making a live film, with exclusive GoPro footage filmed during the recording. This Lunchtime Talk will take place in Watershed, Cinema Three. After the talk you are invited to join us in the Pervasive Media Studio as part of Open Studio Friday, which takes place at the Studio every week.